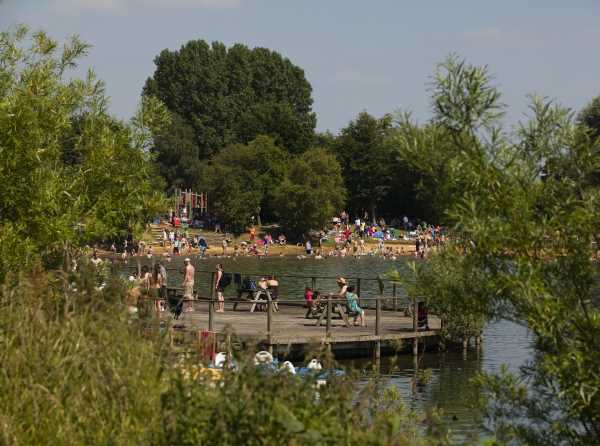 The Cotswold Country Park and Beach – visit ‘the beach in the country’. The swimming area is fully supervised by experienced lifeguards and elements of the visitor experience include a Europlay kids playground (new for 2017! ), a volley ball court, BBQ stations, a training climbing wall and an extensive grassed area for relaxing. Deckchairs, windbreaks, Water Walkers, pedalos, rowing boats and Mini–Port themed electric boats can all be hired on site. The Beach is serviced by the newly refurbished Beach Shack Café offering a smokery and BBQ service, wraps, drinks and ice creams. Planning Solutions has also introduced the brand new Wibit Aquaventure, with 20 separate action packed obstacles to overcome (photo above is illustrative). On the North Lake in addition to the Wibit Aquaventure visitors can also try out kayaking and stand-up paddle-boarding. The Lakeside Building is the main reception point and now incorporates a Pizzeria (with a wood fired pizza oven) and Gelateria. On the second floor of the building – offering panoramic water views – an attractive room is available for social functions, education groups and private parties. Find out more about the Cotswold Country Park and Beach.